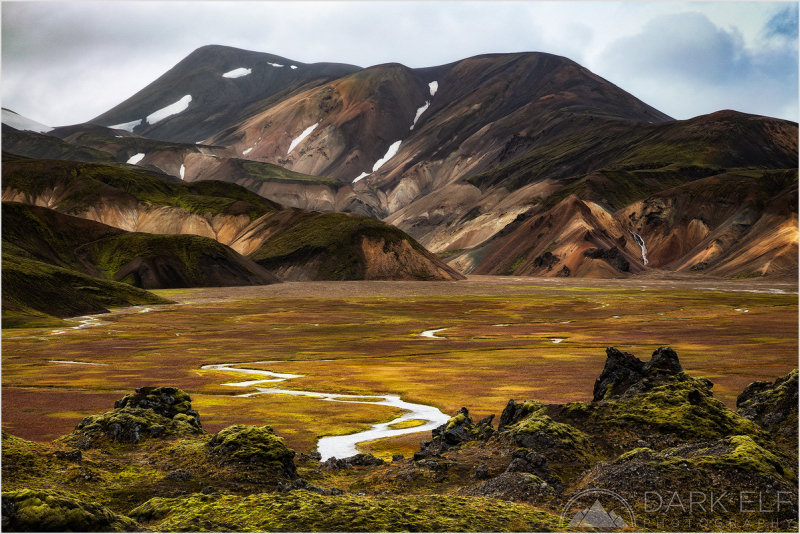 Landmannalaugar is one of the most incredible and one of the toughest places to get to in Iceland. You can access it from the south or from the north. We chose the northern path via Route 26. I can tell you that the last 20 kilometres of this road were just painful. Rocks, holes, stones and mud really take their toll and you have to be very careful driving along. Of course a 4WD is required any F road in Iceland, even though new have seen many people attempting the drive in small 2WD vehicles. At least there were no major ford crossings. There is one right at the end but you do not actually have to cross it in the car. You can follow a path to the visitors centre on foot and leave the car on the other side of the river. The weather changes rapidly over Iceland and especially so in places near mountains and hills. Landmannalaugar was no exception. We had strong winds, sunshine, rain and overcast conditions continually mixing it up as we drove there. We were lucky enough that when we started our hike through the Laugahraun lava, we got nice clear weather, at least for the first part of the trail. It quickly deteriorated from there, however, and conditions first became gloomy and then the drizzle arrived. I took this photo (with a few others) just as we got to the really interesting parts and just before the drizzle became annoying enough to start heading back to the car. I can only imagine what this spot would look like on a sunny day with all the colours of the rhyolite hills coming through. It took a bit of processing power to get this photo looking like I envisaged and in the end I was quite happy with the result. The early Autumn tones came out beautifully in the valley and the layered hills in the distance give at least hint at their real beauty. Staying at the magical Jokulsarlon for the next couple of photos. This one comes from the same morning as the previous post. There was a lot of ice in the lagoon, bunched up overnight by the incoming tide. It felt like being on an ice planet and just around sunrise it was very still and quiet. The only sounds I could hear was the creaking of ice, as the icebergs were rubbing against each other, and the sound of new ice falling of the glacier into the lagoon. Once the sun rose over the horizon, it managed to shine through on some of the icebergs, creating some good points of contrast to the cold tones of the surrounding ice. The tide also changed and you can see the small ice in the foreground being blurred by its movement towards the sea. Literally few minutes later it was a procession of icebergs floating out of the lagoon in rapid fashion. It was a surreal experience to breath in the cold air, take in the landscape around me and to have only the icebergs and a couple of seagulls for company. I might be repeating myself here, but this place has definitely surpassed all of my expectations! 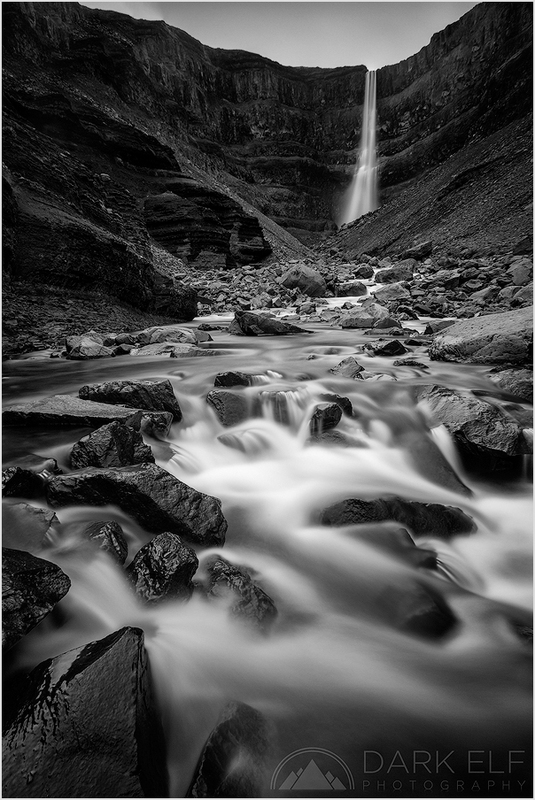 Staying with waterfalls and monochrome for the next couple of posts. 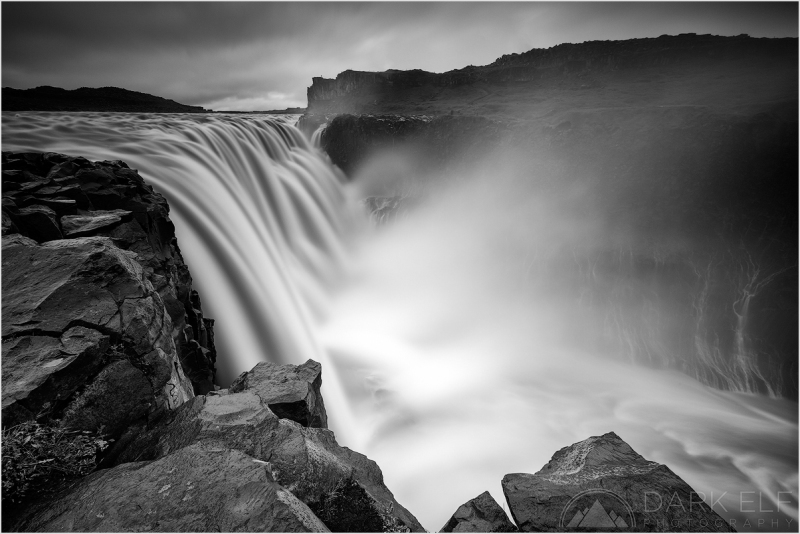 I have previously posted photos from the Selfoss waterfall and Dettifoss is located very close to it, about 1.5km further north on the Jökulsá á Fjöllum river. In fact, when you walk on the eastern side of the river, you first have to pass Dettifoss to get to the other waterfall. This is believed to be the most powerful waterfall in Europe. It is around 100m wide and the drop is just over 45m. One really does feel the power of this waterfall, no matter which side of the river you stand on. The flow is quite hypnotising and it was hard to take my eyes of it when we had to finally leave. Dettifoss featured in the movie Prometheus - the prequel to the Alien series of films. Another well known and easily accessible waterfall in southern Iceland - Skogafoss. Only a little further up the road from Seljalandsfoss when travelling from the west. I took this photo on the morning of the same day as the previous one. I was pretty much travelling up and down all day. Morning to Skogafoss than back to Vik, then to the Dakota plane wreck, then to Seljalandsfoss and then back to Vik again. Iceland is just like New Zealand in the way that there is something new and exciting behind just about every corner of the road. It was hard to come up with a new composition at such a popular location, as most of the angles have been covered already. However, it was one of the waterfalls that fascinated me the most from previous photos I have seen and I was very keen to photograph my take on this spot. In the end, I enlisted the help of a big puddle of water to hopefully capture something at least a little different (although I am sure it has been done before too). I worked the angle and composition to have the Skogafoss reflected in the still surface of the water. The conditions were quite bleak and misty so I had a mono conversion in mind for this particular shot. Converting to monochrome usually brings out quite a lot of hidden detail and extra contrast as well. 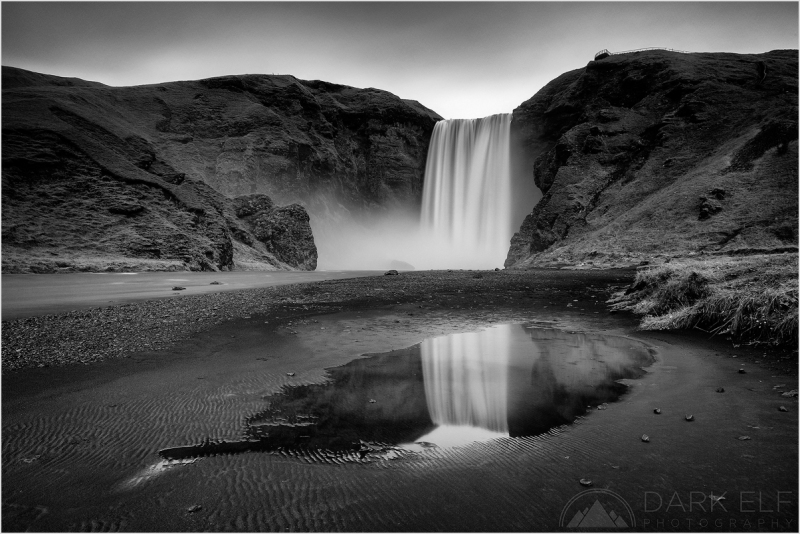 I hope you like my effort at Skogafoss and thank you for your comments on my previous photo. I am totally humbled to receive another spotlight. 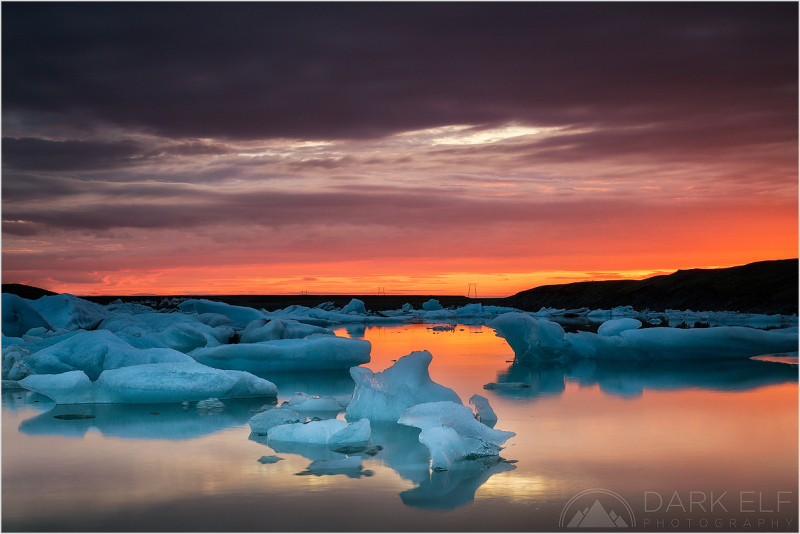 The smaller, clear icebergs that float onto Breiðamerkursandur are just so beautiful. They look like polished pieces of crystal and they come in so many different shapes and sizes. On our last morning there, I concentrated on some of them to try and capture a more "intimate" shot. 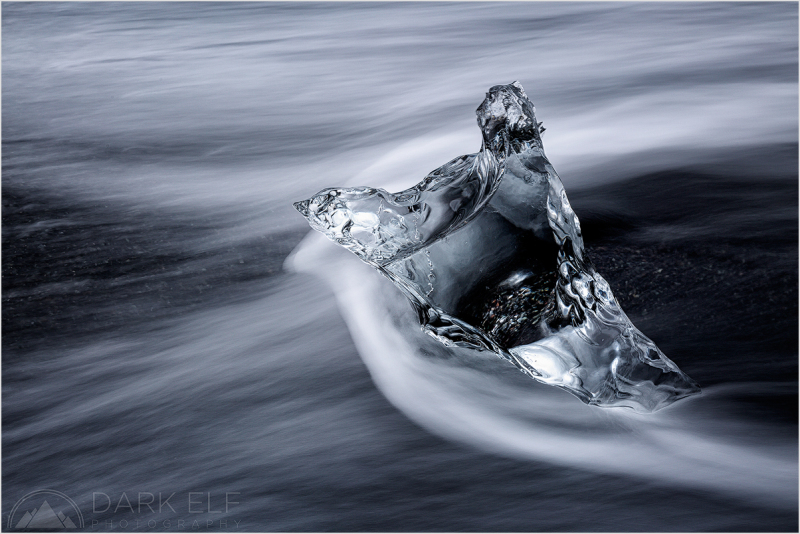 For me it was all about catching the iceberg in focus, reasonably still and about the flow of water around it. I brought my wellington boots and that helped greatly as I was able to get into the water and did not have to worry about getting wet unless a larger wave came along. I wanted to get as close and as low over the iceberg as possible. This ice crystal was of a smaller size and I had to wait for a gentler wave to sweep through so that it remained still for the shot. If you are ever in Iceland, I recommend spending some time at Breiðamerkursandur to explore the black beach. It never quite looks the same on a different day and its beauty is immense. Both fjord areas in Iceland, the Westfjords and the East Fjords, kept most of their treasures hidden away from us under the thick blanket of clouds and persisting rain. When visiting the eastern region, we did manage however, to make a couple of hikes, including the popular hike to Hengifoss (passing Litlanesfoss on the way). The weather cleared enough but it was still very windy and cold. I had to wear a balaclava to keep my face warm during the hike but it was all worth it. Hengifoss is a very rewarding tall waterfall right at the end of the hike. It is the third highest waterfall in Iceland with a drop of 128 meters. Due to heavy rains, the stream was rather rapid and deep in places, which prevented me from getting closer to the fall. I think that the rocks would look stunning in the sunshine because of red layers of clay sitting between the layers of basaltic rock. The horizontal lines that you can see are the red clay that I mentioned. 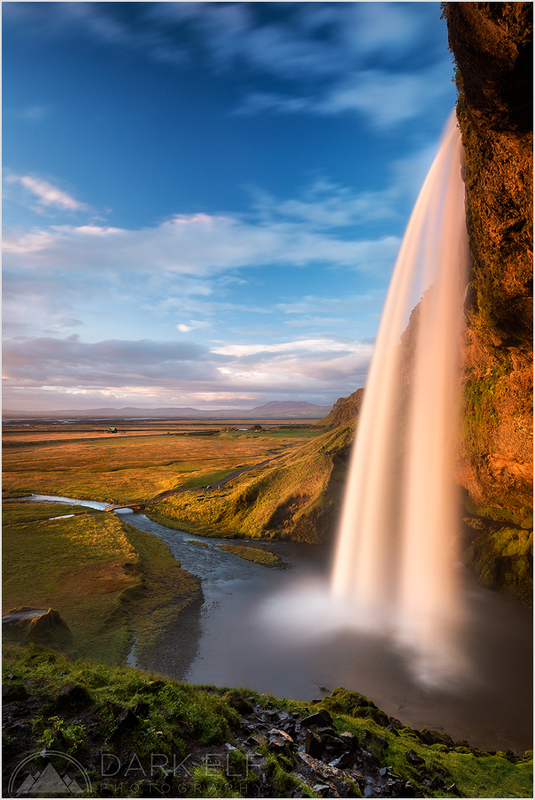 Seljalandsfoss is one of the better known and easily accessible waterfalls in Iceland. It sure is a touristy spot but then again what is not touristy these days, and who am I to begrudge other people the same opportunity as myself to see and capture the beauty of the world that surrounds us. With the above in mind, I climbed a muddy and slippery path and joined a few other fellow photographers perched on a steep hill next to the waterfall, waiting for some late evening light to shine. I can tell you this - I might have been there with many people around me but I was in my own world, absorbing the sight before my eyes, and I bet every other photographer felt the same way. There was an unspoken understanding of sorts that we all shared, that despite of shooting the same scene each of us would still come up with their own version of it. I called this photo "Emotional Flow" because when I was sitting there, trying to keep the mud off the tripod and water spray off the filter, it felt kind of magical to watch the waterfall come alive with the glow of the sunset light. The warm light hitting the cliff and fields was also fantastic and, as always, it faded just a blink of an eye too soon. It shall stay in my memory for a long time, however, and as I made my way down the precarious path, I was glad I could share it with other photographers in a silent bond that brings us together to such places. A word of thanks also to my partner, Paulina, who has plenty of patience and understanding to enable me to be free in my photographer's "zone" during our travels together. Today it is back to the Breiðamerkursandur - the black sand beach near Jokulsarlon Glacier Lagoon in the south of Iceland. I just loved that place, loved being in amongst the icebergs that look like a colony of tiny crystals spread all over the shore. This spot surpassed all of my expectations and whether I was taking photos or just taking in the sights, the feeling was incredible. 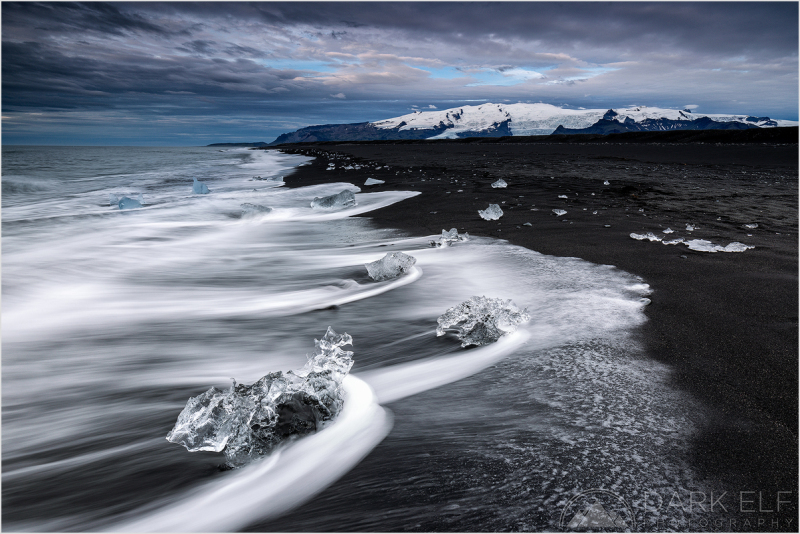 The black volcanic sand of Icelandic beaches provides such a great contrast for the white water to be offset against and for the icebergs to stand out. I was studying the waves and waiting for one to reach just far enough into the beach without complete washing out the foreground. I love capturing motion in my seascapes and I think I got a good dynamic feel to the scene here. 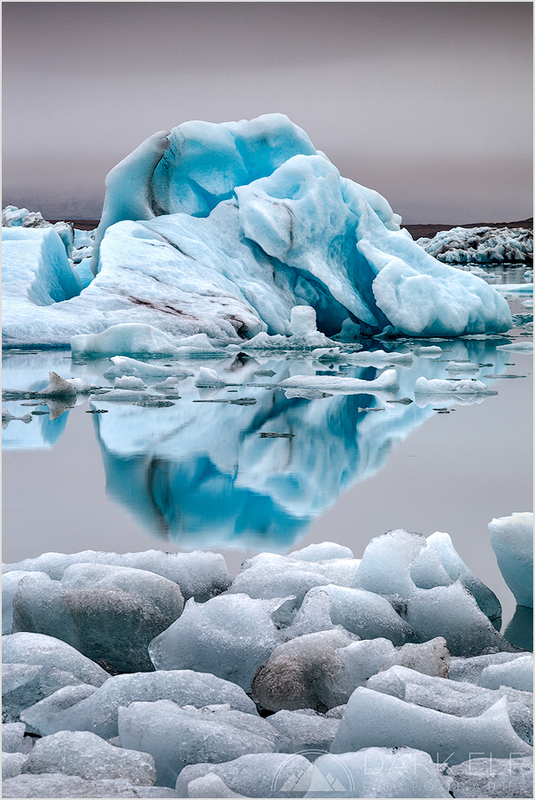 Iceland is full of grandiose landscape and iconic locations. While hunting for the shameless trophy shots, I was also on a lookout for something a little different - strange patterns, bursts of light, unusual formations or contrasting landscapes. The barren and desolate area of Lakagigar was full of such unusual elements. The area is famous for an event that took place in 1783, when an extensive set of fissures opened, forming around 135 craters (hence the name Lakagígar - Laki craters). The craters then spewed molten rock up to 1km into the air devastating the surroundings and causing wide spread consequences for Iceland, Europe and even as far as Alaska and Japan. The fissures are a sight in themselves but the the terrain around them is just unbelievable. 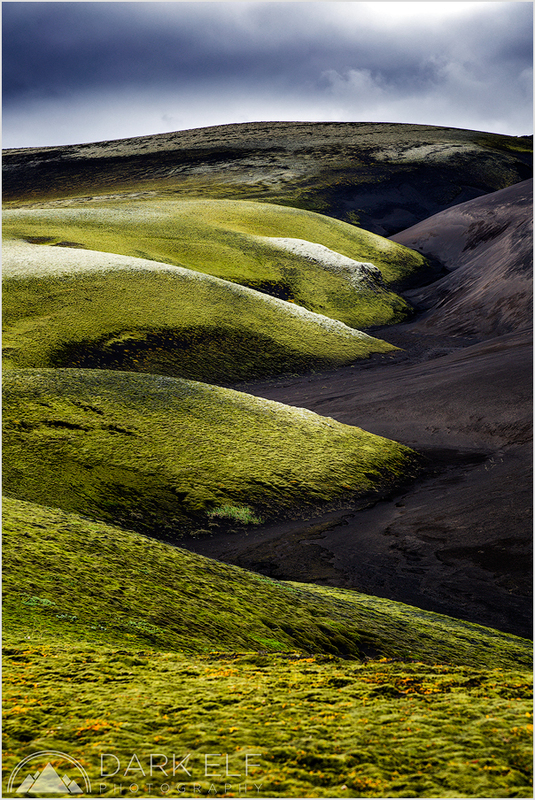 Green and vibrant in places where vegetation has covered the lava, and dark and eerie in other places where black rocks and ash have a sinister edge to them. Together they make for an interesting contrast and this is what fascinated me the most about Lakagigar. That and of course just driving there is an experience in itself. Around 40km of dirt track (coming from the south) and we had to cross seven streams on the way there. Even simple ford crossings are not for the faint-hearted and one has to be treading very carefully. We were lucky that the ford levels were reasonably low. The journey one way took over two hours. I hope you like this different look at Icelandic landscape. Let me know what you think. Time for a mood change from the previous black and white waterfall photos. This one comes from Jokulsarlon Glacier Lagoon and I took this photo during just about the best sunrise of the entire trip. The clichéd phrase "land of fire and ice" comes immediately to mind and I think that during moments like that, one can be forgiven for getting caught up in the general euphoria and using such well worn out terminology. It was in this moment that I understood how true this description was. The burst of colours was just as intense as it was short lived but that morning will stay with me for a long time in my memory. For all of you who celebrate I wish a very Happy Easter! When travelling through Iceland we have noticed a number of abandoned farms and houses all around the country. Each one, no doubt, hiding an untold story of past glories, declines and tough decisions to move on. 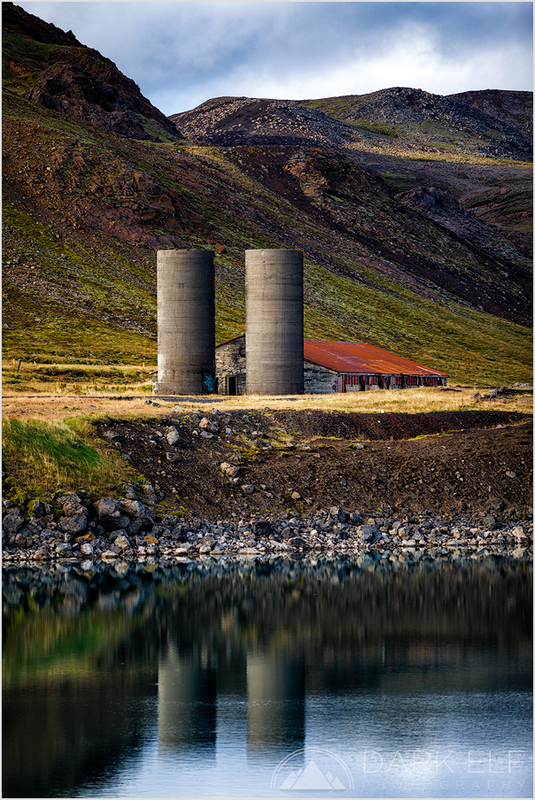 One such farm that caught my attention for a bit longer was this one with ruined silos near the locality of Krysuvik, not far away from Blue Lagoon and Grindavik. There was something striking about this particular farm. May be it was how it fitted with the rugged but colourful surrounding landscape. It seemed almost a natural part of that landscape, now that it has been abandoned for a while. One could almost say that the land has claimed it as one of its own. 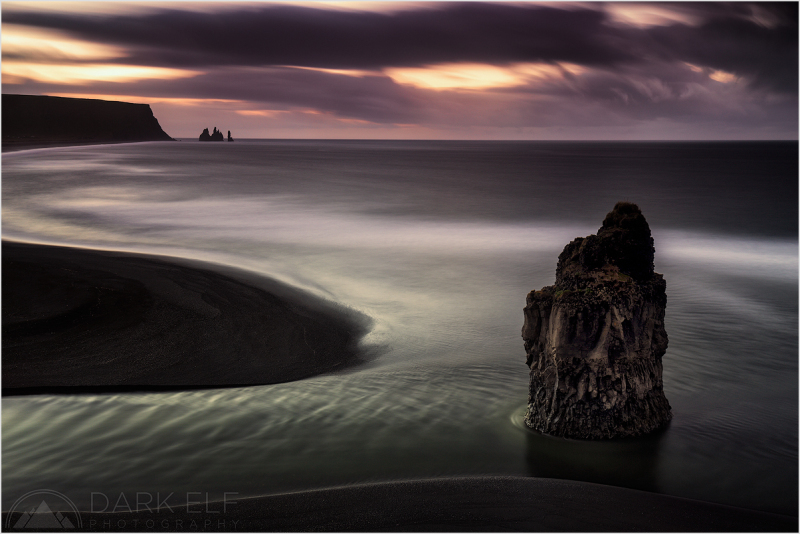 The dark beauty of Reynisfjara, the black beach, and Reynisdrangar, the sea stacks near the town of Vik in Iceland. The long exposure had a rather soothing effect on the rough and dangerous seas around this spot. The waves and swell were huge and nothing like I have ever seen before. I like the enchanting effect of this scene though. It has a certain calmness about it and I think that I achieved a reasonable balance between the sea stacks in the distance and the solitary stack in the foreground. The clouds added just enough movement and interest in the sky. 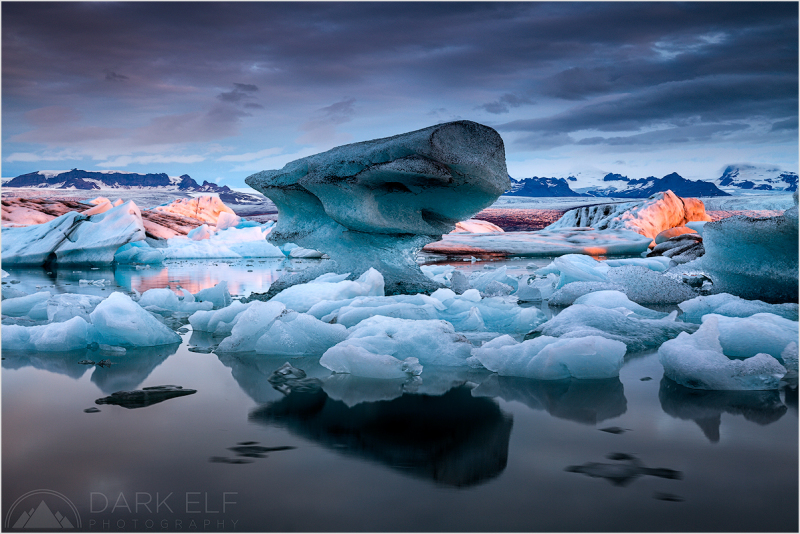 One more photo from a different morning at Jokulsarlon. One that was a lot more gloomy and less intense in terms of sunrise colours. However, it did allow for the glacial blues to stand out on their own. I did a bit of a walkabout with my 70-200mm lens to shoot some "intimate" icy landscape and there was plenty to choose from. Once again, I think I was just about the only person there before the sunrise. I am not sure how busy it gets there during the peak of Summer and during hours of the midnight sun (I might find out in 2017) but in September it was peaceful and very quiet during the mornings that I spent at Jokulsarlon. I would not be able to complete the main series from Iceland without posting at least one road photo. It is hard to drive in Iceland - the landscapes and views are so amazing everywhere that I had to continually remind myself to keep my eyes on the road and not around it. There were many times where I wished I stopped and took photos but often it was a split second decision and once the moment was gone it was too late. 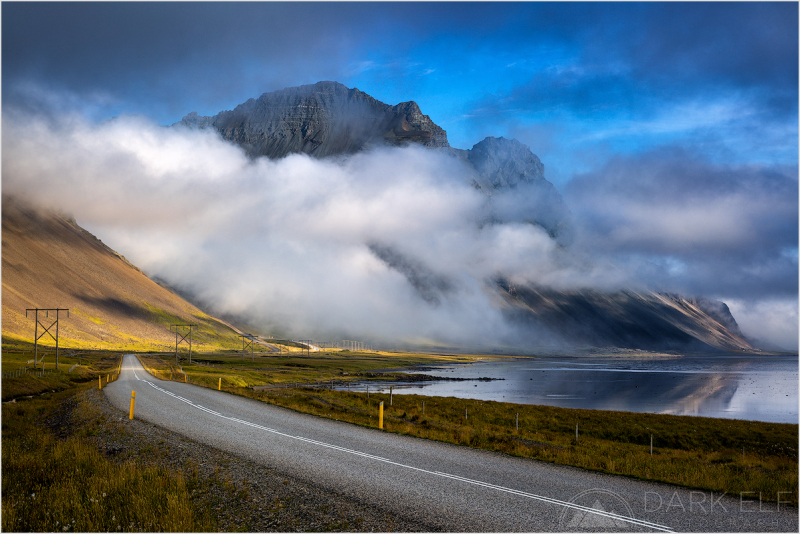 Every now and again, however, I was able to find a safe place to stop and get the camera out - just like here on Route One between Hofn and Stokksnes. We were actually going to photograph the Vestrahorn mountain in the afternoon/evening sun but the clouds you can see here enshrouded it completely by the time we got there. This is almost the end of the main series of photos from our trip to Iceland. I am sure there are other small gems hiding in the archives so no doubt they will resurface at some stage in the future. We travelled over 8,500km in four weeks and still have not seen everything that this amazing place has to offer. It was always going to be one of those places, where the moment I saw the first incredible landscape I would just fall in love with it. It is unreal to think how many fantastic sights can be crammed into such a relatively small country.